Will be provided when you RSVP to mlabarre@seattleu.edu or leave a message at 206 852-9739. 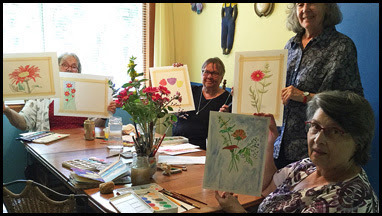 Monday, October 22nd, 1:30 to 3:30 p.m.
No experience or materials are needed for this painting party with watercolors. Come and be part of an afternoon of creative enjoyment facilitated by Heron and Liz Kennedy. Space is limited, so if you'd like to come, please RSVP to mlabarre@seattleu.edu or leave a message at 206 852-9739 as soon as possible, and we'll notify you about the location.